Today, I am 50. 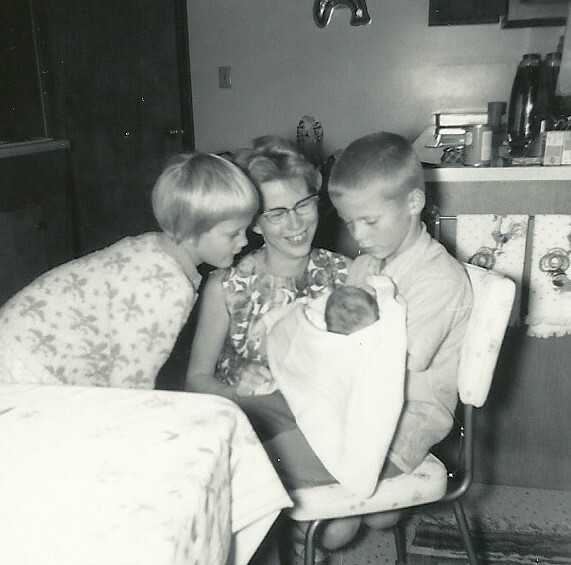 I was born in Minneapolis on a hot summer day, just before dinner time, and exactly 10 years after my brother, Marty. He’s 50? I thought. Hunh…he makes it look really goooood! In a quick search for “famous people born in 1963,” I found several other famous types who share my birth year, many of whom I thought were way younger than me, like Tori Amos, John Stamos, Mike Meyers, Brad Pitt, Coolio, Quentin Tarantino, and Seal. There were a few I thought were older, too, like Larry the Cable Guy and Charles Barkley. I may not be as cool as Johnny Depp, or even as cool as my friend, Shelley, who bought herself a drum set for her 50thbirthday (see “And So This Is Fifty”), but I’m pretty happy with the cool I’ve got going on at 50: great kids, great friends, good cholesterol numbers…. I went through one of my baby books this week and found a few photos that tell some of the story of how I got to be who I am today…kind of. 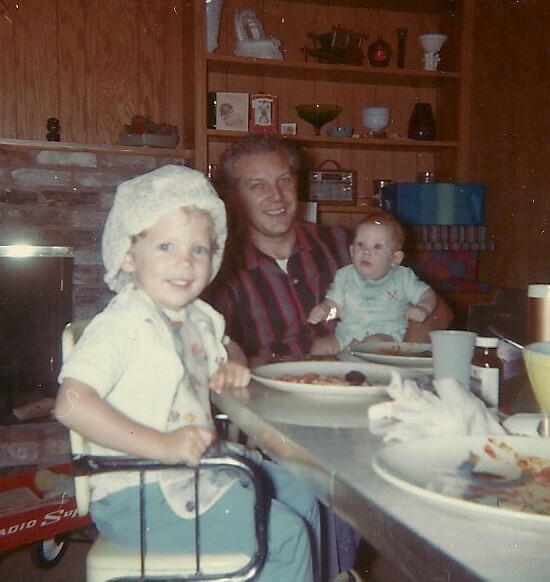 Clearly I didn’t grow up to be Ginger the Movie Star (see #7). But my grandkids think I’m pretty neat and that’s what matters. 1. I’m a middle child, but there were 2½ years when I was the youngest. Don’t let Marty’s face fool you. He might look all, “Ohhhh…isn’t she cute? Another sister! Just what I always wanted!”, but he wasn’t enamored with my presence. My sister Debbie wasn’t real thrilled, either, since she’d held the title of “youngest and only daughter” for seven years. At least she had the courtesy to fake how she felt and smile for the photo. My brother tolerated me for the seven years we lived under the same roof. He let me sit in his room sometimes when he played records (when my mom asked me once to tell Marty it was dinner time, I told her we were listening to his “Yeah yeah” music), and he let me feed his hamsters and salamanders. He went to college in ’71 and we moved 200 miles away, so I didn’t see Marty very often. But as we’ve aged, we’ve gotten closer, particularly in the last 25 years. He made me power-of-attorney three years before his seizure, which I had no idea he’d done until I flew out to Minnesota in 2011 when he got home from the hospital and I went through his legal documents to determine how in the world I was going to help him. While I hate that he suffers as he does, that he trusted me to make decisions for him is very humbling and speaks volumes to our relationship. My sister and I get along famously…always have. Unless, of course, you count the time I stole her crutches after she banged up her leg in a bike-riding accident and I taunted her, “You can’t get me, you can’t get me!” and my mother gave her permission to hit me with them when she got them back. She didn’t, thank goodness, but that was the beginning of my short-lived brat phase, so maybe she should have! 3. I was born with a pigeon-toed right foot and the treatment back in the day was to put a baby in a cast for several months. It straightened my foot about 45 degrees, but because it was still pigeon-toed, I walked slightly abnormally. Nothing you’d notice, but it threw off my skeletal structure and my surgeon is convinced it contributed to my toe, ankle, and knee injuries over the years.This photo is of the first time my right foot felt grass. Either I was skeptical about the grass or it was the moment I decided golf would never be my game. 4. I started stylin’ young. I put a couple of my mom’s curlers in my hair and secured them with a pair of my brother’s plastic pants. I’ve since learned how to use a hair dryer and flat iron. 5. 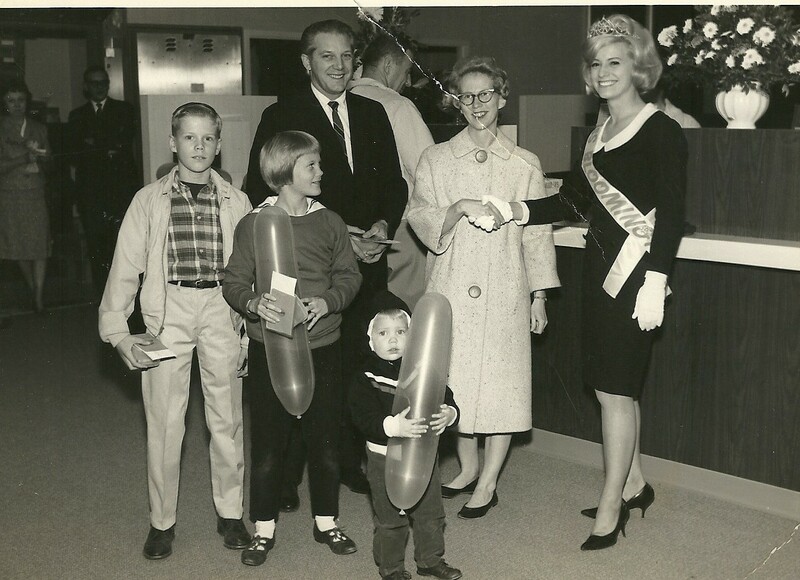 How many people can say they’ve met Miss Bloomington 1965? 6. 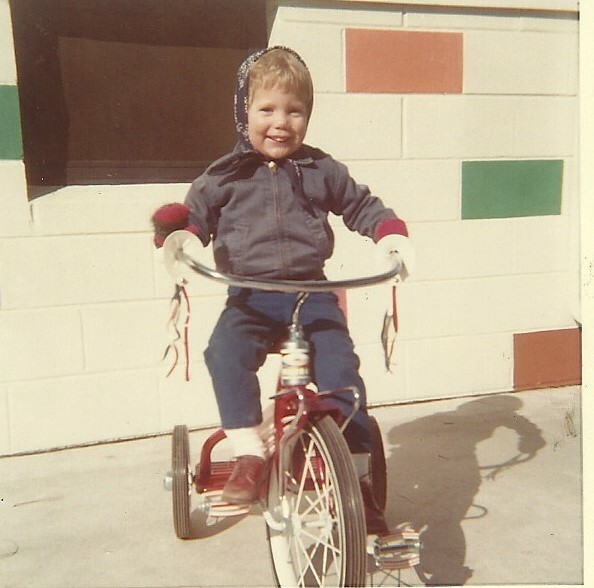 My love for wheels began early, but what I love most about this photo – along with the rockin’ streamers – is the scarf I’m wearing. My mother always put a scarf on my head when it was windy because I developed ear infections easily. I can still remember the feel of her tying the knot tightly under my chin and how I had to open my mouth wide a few times to get it to loosen a bit. I remember the echoes of the wind bouncing off my scarf and I wonder if the doo rag my friend, Debbie, bought me for my birthday will offer that same sound. I really hope it does. 7. My mom and dad were never treated to much affection when they were children, and my mother never heard her father say he loved her. But you’d never know it by the way they raised us. The grooviest part of this photo, though, is my dress. I called it my Movie Star Dress and I wore it as often as my mother would let me. I especially liked to wear it when I watched “Gilligan’s Island.” You could have Mary Ann and her pies and Mrs. Howell and her furs. I wanted to be Ginger and her slinky tight dress when I grew up. 8. I can’t remember a time when I didn’t love books. 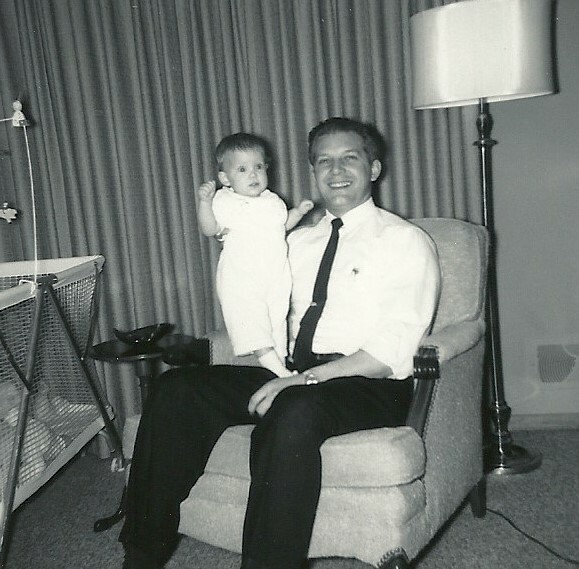 My dad read to me long before I could comprehend anything other than pictures. 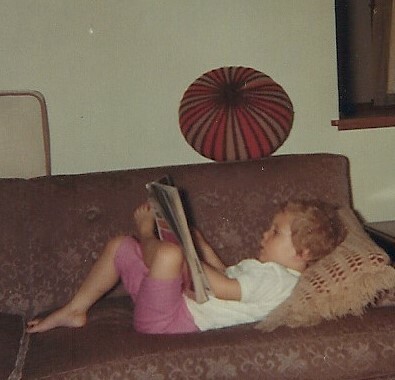 When I was 2, I had memorized a few books and my dad showed off my “reading” skills to the neighbors. I had no idea how to read, of course, but the neighbors were impressed and Dad was amused.I credit my mother for teaching me proper grammar. 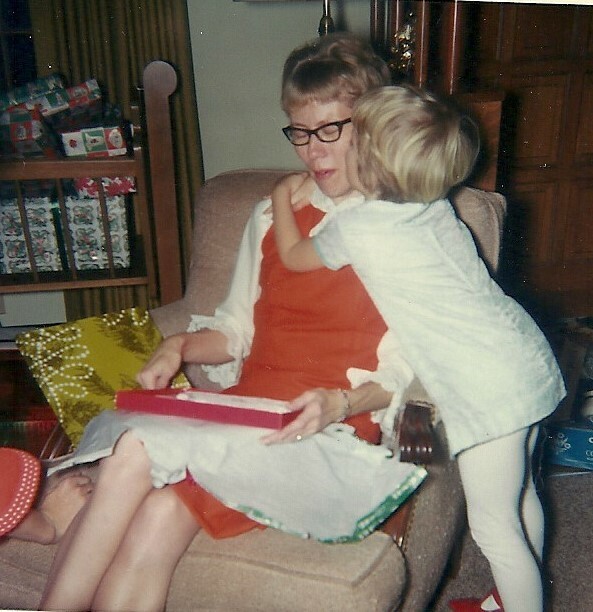 We were never allowed to say “ain’t,” and she corrected me if I said something like, “Her and me…” She also wrote the most eloquent excuses from school. “Please excuse Lynn from school yesterday, as she was ill. Thank you. Most sincerely yours….” When she says she has no idea where I got my gift of writing, I remind her of the school notes and the way she talked so proper. She just laughs and tells me I’m full of it, but I know it’s true, and I can’t image my life without stories, either those I read or those I write. Johnny Depp, Brad Pitt, Mike Meyers, Lynn Haraldson…we were born in the age of Mad Men, JFK, civil rights, Duck and Cover, and the space race. But who I am today is a result of the safety, love, and guidance of my parents, siblings, and teachers, and the many dear friends I’ve made over the years. I welcome this new decade with a renewed commitment to health and personal growth, and sharing the things I’ve learned these last 50 years with my grandchildren, hopefully contributing to their safety, love, and guidance as well.But mostly, I’m going to have a LOT of fun! Bring it ON! 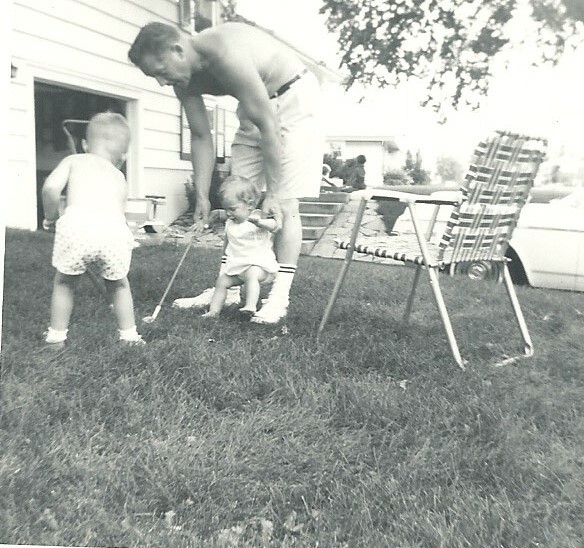 This entry was posted in Family, Memories on August 14, 2013 by Lynn Haraldson. 50 is the new 40. I have found that is true. My 50's have also been better than my 30's. Fifty is very cool, Lynn. I loved my fifties, and my sixties have also been just as good. Life becomes more interesting with the addition of grandchildren and the richness they bring to our lives, as they grow. BTW, you look very much like your mother. Lovely photos–thanks for sharing! Happy Birthday, Lynn! And many more. Glad you and Vickie, and E. Jane and the others are paving the way. Maintaining after loosing does add living years to life. I LOVE everything about this memoir. Happy Birthday dear Lynn! I have loved my 50s – so much of my 30s was spent in a dysthymic haze of self loathing and my 40s were spent starting recovery and learning to sustain it. I have been fit and healthy and sane during my 50s and I am grateful for these wonderful years. May only good things come your way – Happy Birthday! Happy Birthday my friend! %0 is the start of the best decade ever! I loved your look back. It made me think of my childhood, and how very grateful I am for the parents I had. the 50s can be a time of new self discovery and transition. BRING IT ON! Happy Birthday! I agree you look like your mother 🙂 Great pictures. I bet you will totally rock the next decade! Woohoo, you are part of the cool kids club now!!! You make 50 look good, lady! Love the walk down memory lane, and the pictures. What a cutie-pie you were (and still are)! I see that you too were the victim of those barbaric treatments they used to “cure” us of being pigeon-toed. 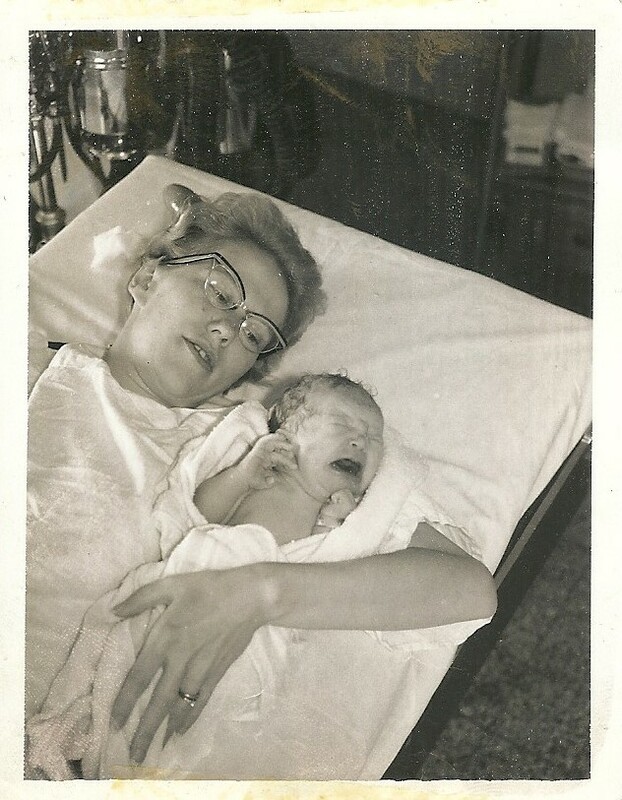 I was born in 1956 and they made me sleep in shoes held in position by a metal bar. I'm no longer pigeon-toed, but I've got severe hip, back and knee problems, as you know. Apparently, the kneecap of the knee that I will eventually have replaced is completely BESIDE where it should be. There's a word for “medically induced conditions”, I just can't remember it. Ah, the wonders of “modern” medicine! Be well, my friend and enjoy the next fifty years! Welcome to the over 50 club! It's a great place to be!! Definitely think age is just a number. In fact, I'd actually say the older you get the cooler you are because you have more experience, wisdom etc. (so I'm told lol).